The quality of drinking water and bathing water, and the effectiveness of waste water treatment across the European Union continues to improve, according to a new European Environment Agency (EEA) report published today. However, pollution from sources like waste water treatment plants, agricultural runoff and storm water overflows, and emerging risks like micro pollutants from personal care products pose challenges to maintaining clean and healthy water for people’s use. The EEA report ‘European water policies and human health,’ provides a combined review of three key legislative acts that underpin water management in the EU — the Bathing Water Directive, the Drinking Water Directive and the Urban Waste Water Treatment Directive, which contribute to achieving the over-arching objectives set by the Water Framework Directive. EU water legislation makes a significant contribution towards ensuring public health and environmental protection across Europe. The EU legislation sets binding standards for Member States to ensure high water quality for drinking and for recreational purposes, and to limit pollution caused by waste water discharged to the environment. Member States must report key parameters of water quality and management measures under these rules. These include ensuring that all significant discharges of sewage from homes and industry undergo collection and treatment, defining water quality suitable for bathing waters and setting requirements for the quality of drinking water to protect human health. The EU’s water policies on bathing water, drinking water and urban waste water have been effectively applied across the 15 older EU Member States while Member States that joined after 2004 are making steady progress on reaching the objectives. Bathing water quality across the EU continues to be high. The percentage of bathing water sites meeting the minimum water quality standards (of at least sufficient quality) increased to 96.1 % in 2015. Testing and analyses between 2011-2013 show achievement rates of over 98.5% in meeting EU standards on clean drinking water. Wastewater treatment in all parts of Europe has improved during the last 15-20 years, with a growing proportion of the population connected to waste water treatment facilities and with the waste water being treated to more demanding standards. Achievement rates in the EU-15 are in general very high, while, though improving, in Eastern and South-Eastern Europe the proportion of population connected to wastewater treatment is still relatively low compared to Central and Northern Europe. North: Finland, Iceland, Norway, Sweden. Central: Austria, Denmark, England and Wales, Scotland, Germany, Ireland, Luxembourg, Netherlands, Switzerland. South: Cyprus, France, Greece, Malta, Portugal, Spain. East: Czech Republic, Estonia, Hungary, Latvia, Lithuania, Poland, Slovakia, Slovenia. West Balkan: Albania, Bosnia and Herzegovina, former Yugoslav Republic of Macedonia, Serbia. Pollution from agriculture and from storm water overflows continues to pose problems in maintaining and improving water quality. Nitrogen and phosphorus from waste water treatment plants and industry, and emissions from agriculture — fertilisers and manure — remain the main sources of nutrient and organic pollution. Importantly, the report also highlights the emergence of other pollutants, which are typically chemicals present in low concentrations but which may have harmful effects on aquatic organisms or those that feed on them. Micro-plastics, such as those found in personal care products, and micro-organisms resistant to antibiotics, present risks which need to be better understood. EU water legislation and, in particular, the Water Framework Directive, provides ways to address these challenges. The EEA report also stresses that better integration of EU legislation on water may help to deal with current and future challenges. Water is an essential resource and ensuring high quality and safe supply to all Europeans is an integral part of the EU’s environmental policy. Since 1975, the EU has worked to adopt a wide range of legislation on water that aims to protect consumers and water users, including the environment, against harmful effects. In Europe, about 50 % of drinking water is taken from groundwater and about 40 % from surface water. Ten percent of drinking water is used from other sources, like artificial groundwater recharge or bank filtration water. Urban waste water treatment Wastewater treatment in all parts of Europe has improved during the last 15-20 years. 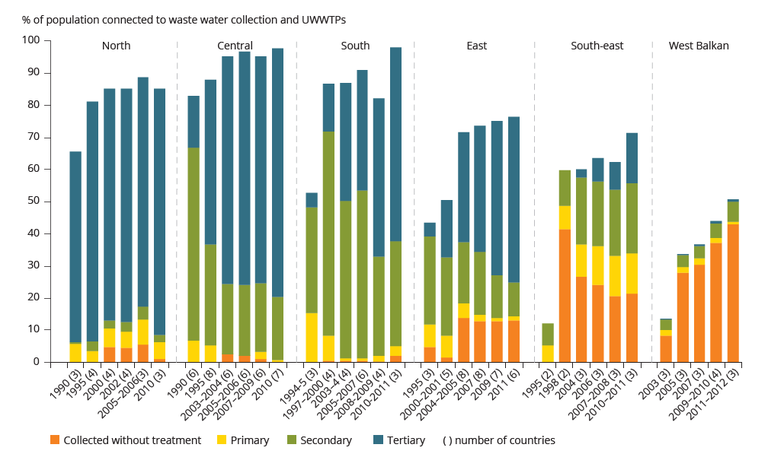 The percentage of the population connected to wastewater treatment in the Southern, South-Eastern and Eastern Europe has increased over the last ten years. Latest values of population connected to wastewater treatment in the Southern countries are comparable to the values of Central and Northern countries, whereas the values of Eastern and South-Eastern Europe are still relatively low compared to Central and Northern Europe. For references, please go to https://www.eea.europa.eu/highlights/quality-of-europes-water-for or scan the QR code.